I’m trying to get a better understanding of flash photography. Before my 430EX II arrives, I wanted to first get a bit of practise. I just went and grabbed some fruit (yeah we always have lots of fruit lying around..) and placed them on a well lit table next to the window. 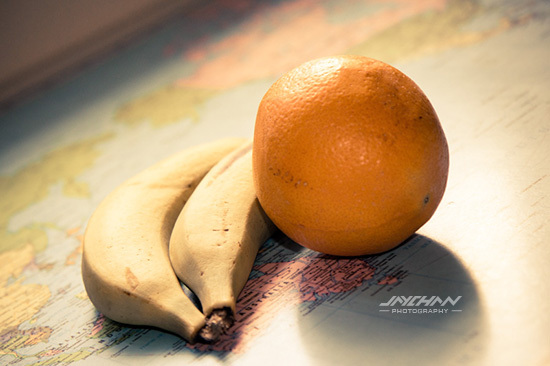 Now the typical problem will be that the table surface and the background will tend to be properly exposed, leaving the back of the orange and parts of the banana under exposed. Applying a bit of flash as a fill light could solve that problem. So I did the test only by using the built-in flash on my 60D and the result was quite satisfying. It brought out the details and brightened up the shadows. Except the problem is you could see some specular highlights on the orange and clearly a 2nd light source is present as you can see 2 areas of light on the orange. The 430EX II could solve this problem with it’s larger and more powerful surface light area to create a softer fill light. Will find out Wednesday!